We are more prone to coughs and colds over the chilly winter months. But, as the temperatures start to climb and the days lengthen, you might find yourself left with a cough that refuses to go away. This is referred to as a chronic cough and it can be exhausting, potentially leading to disrupted sleep, headache, dizziness, fainting and loss of bladder control. 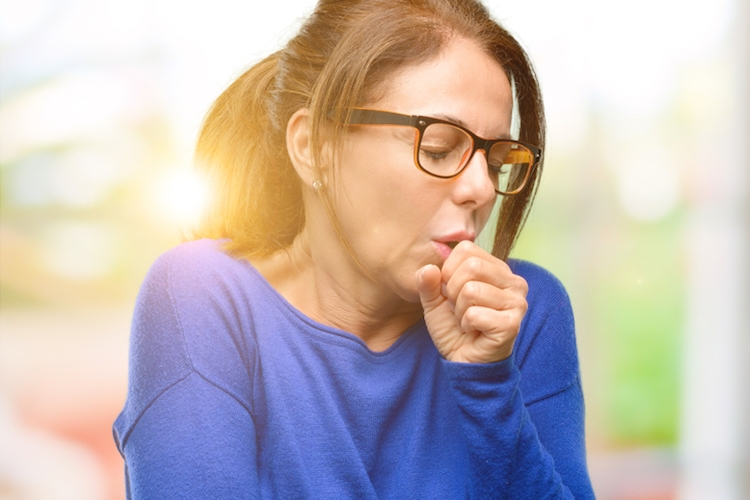 It is important to get a diagnosis because a chronic cough can be a symptom of a serious condition like lung cancer, although more often than not it has another, less serious cause. So, how do you identify a chronic cough and what treatments are available? A chronic cough is defined as a cough that lasts more than eight weeks in adults or four weeks in children. However, we generally recommend seeking medical advice if you have a cough that has lasted three weeks or longer. Women are more prone to developing a chronic cough than men because they have a more sensitive cough reflex. Coughing is a natural reflex that serves an important purpose in your body, helping to rid your lungs of germs, mucus, dust and other irritants. If you couldn’t cough, these irritants might cause illness and infection. However, when a cough goes on for weeks or months it is normally linked to a wider medical issues which needs to be diagnosed and treated. The good news is that most chronic coughs can be successfully treated once diagnosed. Postnasal drip – mucus from your nose or sinuses running down the back of your throat, triggering your cough reflex. Gastroesophageal reflux disease – this common condition causes acid to flow from your stomach into your throat causing irritation and leading to chronic coughing. The cough then worsens GERD creating a vicious cycle. Chronic bronchitis – this is an on-going inflammation of your bronchial tubes, often linked to smoking. It is usually part of a spectrum of smoking-related lung diseases called Chronic Obstructive Pulmonary Disease (COPD). Infections – after other symptoms have cleared, the infection that caused a cold, flu or pneumonia can linger in the lungs. Chronic cough is often caused by pertussis (whooping cough). Other less common causes include lung cancer, cystic fibrosis and aspiration (foreign objects such as food in the lungs). Your doctor will ask you about your symptoms and perform a physical examination. If the cause can be identified, you may begin a course of treatment. X-rays, which are used to check for lung cancer, pneumonia and other lung diseases, as well as sinus infections. CT scans, which are also used to check the lungs and sinuses for infection. Asthma drugs to reduce inflammation and open up the airways. Acid blockers to treat acid reflux. Cough suppressants if the reason for your cough can’t be determined. If you have a chronic cough you should never ignore it. Talk to us about the range of diagnostic and treatment options available to you.